Kent Farrington and Uceko. Photos © Spruce Meadows Media Services. Calgary, AB, Canada – July 3, 2015 – The ‘North American’ Tournament at Spruce Meadows continued on Friday with two feature competitions hosted in the International Ring and a win for USA’s Kent Farrington and RCG Farm’s Uceko in the highlight $50,000 Lafarge Cup 1.50m. Also competing on Friday, Mario Deslauriers took a big win in the $34,000 Pepsi Challenge 1.45m riding Lisa Deslauriers’ Scout de la Cense. Continuing through Sunday, July 5, the ‘North American’ Tournament boasts $1.3 million in prize money across 14 FEI events throughout the week. Highlights include the $400,000 ATCO Power Queen Elizabeth II Cup on Saturday and the $210,000 Cenovus Energy Classic Derby on Sunday. Watch highlights from Friday’s competition at Spruce Meadows. Spain’s Santiago Varela continued a successful week of course building with the $50,000 Lafarge Cup Friday evening. The competition saw 33 entries, with seven in the jump-off and three double clear rounds. Emanuel Andrade (VEN) set the pace with a clear track in 44.39 seconds to place third with his own Bon Jovi. 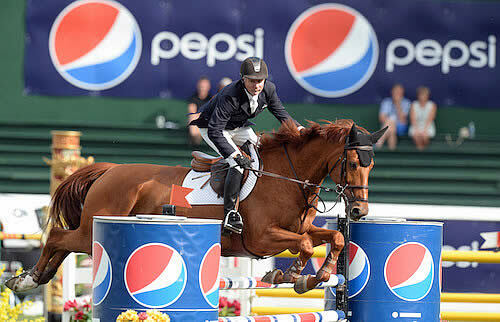 Kent Farrington and Uceko were next to clear the short course in a blistering pace of 42.22 seconds to take the win. Eric Lamaze (CAN) did his best to catch the time with Artisan Farms LLC’s Fine Lady 5, but finished just off the mark in 42.35 seconds to finish seconds. In a very fast jump-off, Farrington knew he had to lay it all on the line with Lamaze coming right behind and three more riders to follow. Uceko, a Dutch Warmblood gelding (Celano x Koriander), is 14 years old and Farrington has been careful to manage his schedule and choose the appropriate venues to compete in. A total of 76 entries jumped the first round of the $34,000 Pepsi Challenge 1.45m on Friday, with 19 qualifying for the jump-off and 17 continuing on. The short course saw only five double clear rounds in a very fast race against the clock that put Mario Deslauriers (USA) in the winner’s circle. Eduardo Menezes (BRA) set the challenging pace in 43.53 seconds aboard his mare, Catalina, and held the top spot through most of the jump-off. It was Deslauriers, however, who stole the lead for his first win in the International Ring since 2012. He completed the fastest clear round in a time of 42.35 seconds riding Lisa Deslauriers’ Scout de la Cense. Nicola Philippaerts placed third in 44.66 seconds with Ludo Philippaerts’ H&M Harley vd Bisschop. Originally from Quebec, Deslauriers switched to U.S. citizenship six years ago. Regardless of nationality, a win at Spruce Meadows was still very special to the rider. During the ‘National’ Tournament’s Omega Alpha Cup in June, it was Menezes who won and Deslauriers who finished second in a two-horse jump-off in the All Canada Ring with Catalina and Scout de la Cense, but this time Deslauriers made sure he was faster. Nine-year-old Scout de la Cense is a Selle Francais gelding by Easy Boy x Crazyhorse of Coco. He is one of several promising young horses that Deslauriers is developing, and the rider was happy to get a big win with the horse, especially at Spruce Meadows. The ‘North American’ Tournament continues on Saturday featuring the $400,000 ATCO Power Queen Elizabeth II Cup as well as the $85,000 TD Cup.